CentrePoint on Colombo wins again! Today has been a busy day on the Motel front with a wide range of good news rolling in…..
We are there on Page 12 between the Jailhouse and The George. Look at that! 3 top accommodation providers from different genres all together - ranging from $30 to $886!! Jailhouse – Top Backpacker, CentrePoint on Colombo – Top Motel, The George – Top Hotel! Will also mention Orari B&B – Top B&B just to our left!! We congratulate Lonely Planet on producing a comprehensive guide to post quake Christchurch that can easily be said to be the best guide to our new city at time of printing!! Most noticeable is that they have shown the central city area is alive and well and very much a place to visit!! 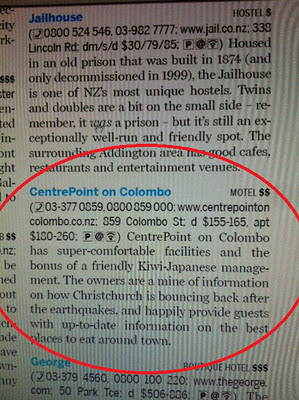 We are proud to be recognised in this way by one of the world’s top travel magazines and look forward to welcoming LP users to Christchurch! Received the latest update for our all new motel website that we are working on. Starting to come on nicely and that gave us an extra little buzz!! Sorry but it’s all under wraps till we can get it together……..stay tuned. Gotta live the good times and we did indeed today!! We blogged about our first Trip Advisor Traveller’s Choice Award last year and we’re proud to say we’ve done it again this year in the awards announced today! Only this time instead of just 1 section we’ve won in 2. 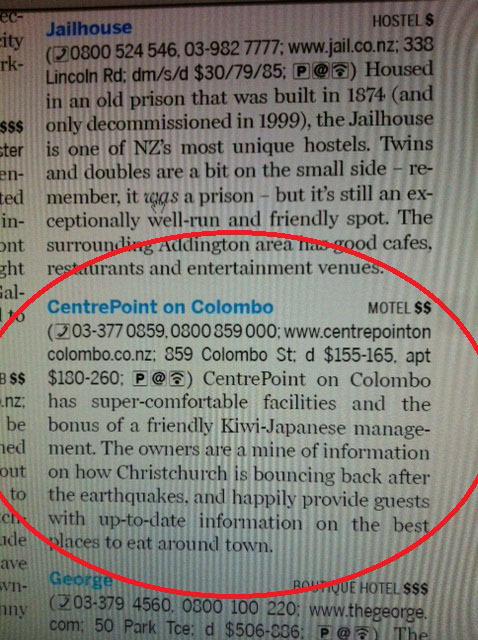 CentrePoint on Colombo Motel is in the Top 10 Hotels for Best Value (it’s actually called “bargain” but that doesn’t fit well grammatically so we used the English translation of the Japanese language page phrase!) and an award winner in the Best Service in South Pacific Category by TripAdvisor in its 2012 Travelers’ Choice Awards. We’re pretty happy but before we give ourselves a well deserved pat on the back, we’ll say thanks to all those guests who took the time to review us on Trip Advisor! Best Service 2 years in a row is great but we do find this year’s addition of the “bargain” title an interesting one because it’s the section we most often get marked down in guest reviews. We often get told we are expensive... so does this mean can we raise our rates?! It’s interesting to see that this year, 4 Christchurch Motels have made it into the top 25 for Best Service and 3 in the Bargain category – meaning that despite the shakes Christchurch is a place where you’ll get Great Service at a Good Price. After recently being lauded by the Lonely Planet as one of the most exciting cities in New Zealand, Christchurch has now been given accolades from visitors over the last year and we hope that our RTO – Christchurch and Canterbury Tourism – uses this piece of good news to encourage more people to visit the city. As for us, well it might just be a nice bottle of wine with dinner this evening!